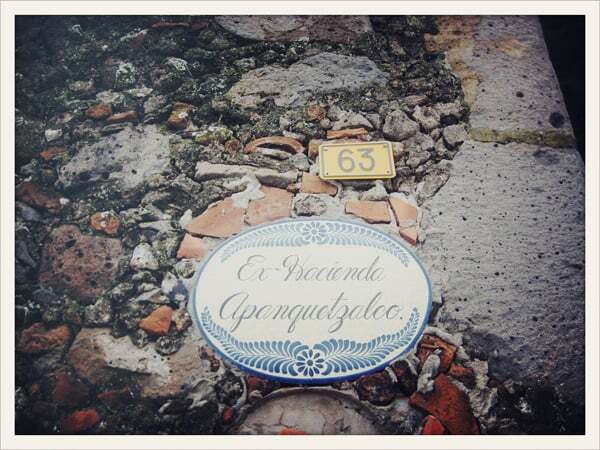 A few years ago, I spent a beautiful weekend with a large group of family friends in Cuernavaca, Morelos, Mexico. While I was there, we witnessed some pretty spectacular sunsets each evening as we gathered on the patio for dinner. I couldn’t resist pulling out my camera to capture the golden sky as the sun slipped away from us. If you follow the news, you’ve probably heard a lot of fuss about a volcano in central Mexico that’s been spewing ash, rumbling and causing concern lately. That volcano, which stretches into parts of three bordering states (Mexico, Puebla and Morelos) is Popocatépetl—also known affectionately as Don Goyo. 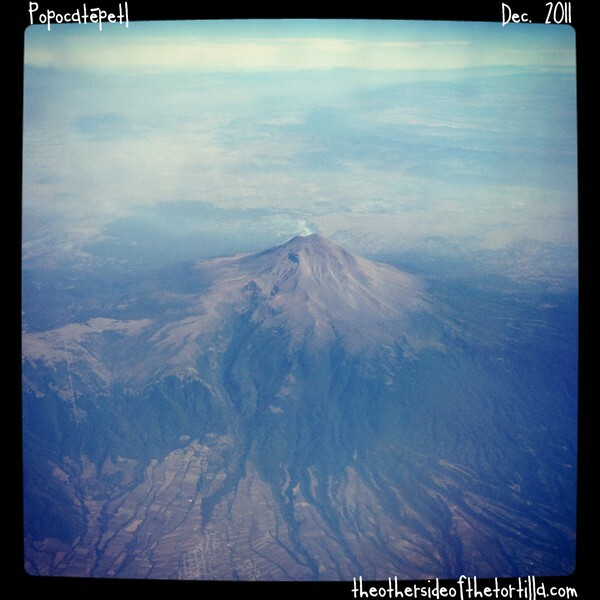 Here’s a photo I took of the volcano when we flew over it on our way to Acapulco in December 2011. I’ve flown over it many times but have never actually visited it while on the ground—but I’d definitely like to get up close to check it out someday. On a very clear day you can sometimes see Popocatépetl from different vantage points in Mexico City, including a spot near where my suegros live. This past weekend, I spent some time with my suegros at a friend’s weekend home in Cuernavaca with a group of my suegra’s best friends from college. Cuernavaca is located in the state of Morelos, Mexico. They were all at our wedding in Los Cabos nearly two and a half years ago, so it was wonderful to see them all in one place again. And the last time I was in Cuernavaca was two years ago when we stayed at the Camino Real Sumiya for a short New Year’s vacation, so I was overdue for a visit. 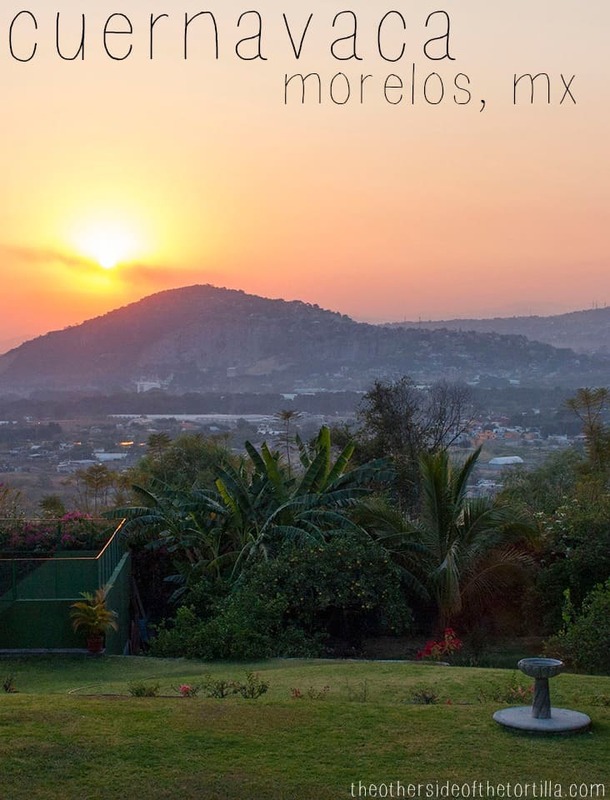 Cuernavaca is nicknamed the city of eternal spring because of its pleasant year-round climate and is located about an hour outside of Mexico City. There’s a little bit of something for everyone: museums, resorts and spas, ecotourism that includes national parks, and an abundance of historical architecture including a palace that belonged to Hernán Cortes. According to the Mexico Tourism Board, the palace is the oldest example of viceregal architecture on the American continent. The first time I saw it two years ago, I was in awe – to think of how long ago the palace was constructed and that it still exists today left an incredible impression on me. At the home where we gathered in Cuernavaca, there was an abundance of food, dancing, chatting, food, swimming, fireworks… and more food. The fireworks weren’t ours, though; we just enjoyed someone else’s from afar. My suegro told me that it’s fairly common in Cuernavaca to see fireworks when there’s a wedding. In the food department, we had a little bit of everything: fruta, huevo con chorizo, barbacoa, tamales, paella, pollo, botanas, tortitas de bacalao, quesos, jamón serrano, flan, paletas, just to name a few things.